We've been in the nut business since 1929 and one thing we've learned is that squirrel lovers are some of our most loyal customers! Whether you are a casual squirrel watcher, a close friend to the squirrels in your yard, or keeping squirrels as pets, we know what you guys want - hazelnuts (aka filberts) and lots of em! We are setting up this page as a place you guys to share with us. Send in your photos, stories and ideas to feedback@nuts.com! We will post them here. Sue writes in, "Love your nuts and fast excellent service. 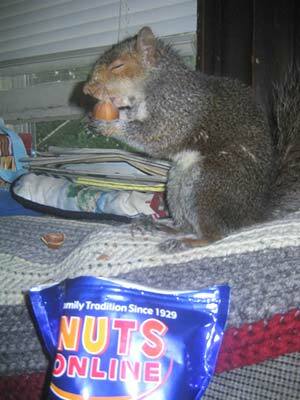 Attached is a picture of our very satisfied squirrel. He only eats your excellent hazelnuts."